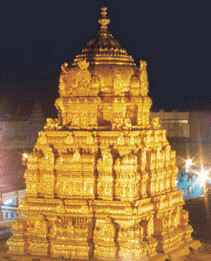 Tirupati (Andhra Pradesh) - Tourism, Hotels, Packages & Photos - Pushpak Destinations! One of the eight most sacred places of Mahavishnu, hailed as Swayamvvakta Kshetras, Tirupati, the abode of Lord Venkateswara, is acclaimed as the holiest of the celebrated 108 Tirupatis or Vaishnava Divya Desams. One of the most ancient and spectacular places of pilgrimage Tirupati owes its existence to the sacred temple of Lord Sri Venkateswara situated on the Tirumala Hill lying adjacent to it. The hills of Tirumala are the second oldest rock mountains in the world and together admired as Saptagiri, an aerial view of these seven hills extends the impression of Adisesha, the mythological serpent, lying majestically with its seven hoods. A traveler reveals, 'the most clean and peaceful place in South India'. Yet another traveler comments, 'It gives you a total out of this world experience'. There are several nice accommodation facilities in Tirupati. Here is a list of hotels in Tirupati in prices ranging from Rs. 600 to Rs. 3000. The most sacred and richest temple in the world, Sri Venkateshwara Temple has Lord Venkateswara or Balaji as the presiding deity. Located on the seventh peak, Venkatachala the awe-inspiring idol of the Lord of the Seven Hills is described as the great bestower of boons and deliver mukti to his ardent devotees. An important pilgrimage center thronged by tourists round the year who wait for hours in serpentine queues to get a moment's glimpse of the deity, the temple boasts of a pulsating and colorful culture that speaks volumes about its grand past. Built in the Dravidian style of architecture, the gopuram of the legendary temple is completely veiled with gold plate, its major highlight. Dedicated to Sri Kalahasteeswara, the Sri Kalahasti Temple is revered as one of the Pancha Bhutha Sthalas, an ancient Saivite pilgrim centre. This temple also sees huge crowd of devotees each year. Situated at the base of the Saptagiri Hills the Govindarajaswami Temple has a Vishnu shrine as its presiding deity. Belief reveals that the lord is still paying the interest to Kubera, the celestial cashier on the huge funds he had given to Srinivasa for his wedding with Padmavathi. Hotel Sunilkrishna (Rs. 700), Bhimas Deluxe Hotel (Rs. 1550), Kalyan Residency (Rs. 1695) and Ramee Guestline Hotel (Rs. 2500) are some of the most preferred hotels in Tirupati . Make sure to check out reviews of Tirupati hotels and book only a highly rated hotel within your budget. Places to eat - The TTD prasadalam near the bus stand offers dosa at Rs 5, all other foodstuff also at subsidized rates. Don't forget to enjoy milk there. A traveler says, ‘open air type, very tasty and humble service.' Have noodles or veg biryani at just Rs 30. You can try Woodside and Mayura restaurant near to the temple to get authentic taste of South Indian food. Best hotels in Tirupati - Check out Tirupati hotels with the best customer ratings. Featured budget hotels - Hotel Gopikrishna, Tirupati was one of the featured budget hotels for October. 3 Days in Tirupati - Find out how to spend 3 days in Tirupati?